Onry Ozzborn: 'My fav rap duo of all time? Outkast.' Onry Ozzborn likes to surround himself. The Seattle lyricist first emerged on the scene as a member of Northwest hip-hop collective Oldominion in the late 90's. 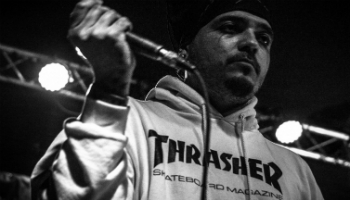 Then came Grayskul: together with JFK, he released two albums on Rhymesayers Entertainment. And then there is Dark Time Sunshine, with producer Zavala. Now, for his fifth solo album, Ozzborn invited multiple friends and acquaintances to join him on 'DUO'. For each track, he invited one guest. 'I started out recording random verses to beats, sometime in 2010 with no plan whatsoever. After having like 6 or 7 unfinished songs just lurking, I started hearing some of my friends voices on each of them. I reached out to them. They obliged me with verses, after which I would complete each song. I then knew I wanted to make a duet album. How do you know a particular guest matches a certain track? I always feel like music has words already. It's just our job to find them. That's always been my take. For this particular album I knew who could accompany in doing so. Most guests you know for a long time. But not everyone, right? Homeboy Sandman, Dem Atlas and Theory Hazit were more of acquaintances at the time. I now consider them more of as friends. I really admire their work. What's your fav rap duo of all time? As a coffee lover, what kind did you drink during the recording sessions? Americano with 2 pumps of chai and a little bit of soy. Now I like it better with a splash of coconut milk instead. The album's gonna be released on vinyl, on cassette,... there's even a movie. I'm releasing 'DUO' in 6 different ways. All are different from each other and exclusive through song, artwork, etc. 'Duofilm' is the visual version of the whole album. It's out now. The vinyl version will be out in June, the cassette tape in July. There's also a book: a behind-the-scenes Polaroid book of 'duofilm', signed, with a download card of the film. It should be out by July as well. Cassettes rule and are back in style now. Do you play cassettes yourself? I don't own a player but I soon shall. A few years ago you said your goal was to make timeless music. I have no goals when making music now. I just make what I feel and then let it go. If it resonates with people and they can relate: awesome! Do you feel like a lot of albums stay stuck in certain time frames? A lot of folks do what's trendy. But I feel that it's always been that way to a certain extent. Those that have made timeless music are going to don't try to. It just happens I believe. You can tell the difference. You're involved in quite a few projects. What's next for you? Dark Time Sunshine - 'LORE'. Oh yeah and what will your next tattoo look like? A red 07 Chevy, super blurry in the sky with its soul falling from beneath it! 'DUO' is out soon on Fake Four Records.